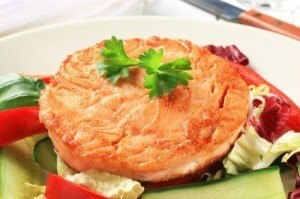 You can enjoy scrumptious salmon patties without going to an expensive seafood restaurant. 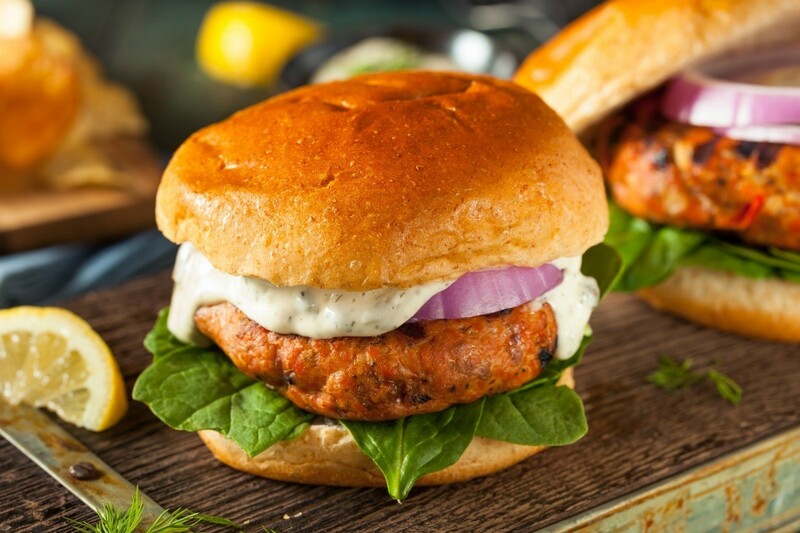 This page contains salmon patty recipes. It's trendy to call salmon patties burgers now, and to charge a fin and a gill for them, but I'll stick with patties. This recipe is very economical and very easy. Adding potatoes and oats really stretches the salmon, and makes them a bit milder tasting - and it's easier to get kids to eat them! If you plan to have leftover mashed potatoes on hand, it makes these even easier to whip up when you need a fast, easy, and nutritious meal. The real twist here is that you bake the patties in a muffin tin, really reducing the fat and making them even healthier. I make a big batch and freeze some. Mix everything but the salmon in a bowl and let it soak into the oats for 5 minutes. Mix the salmon in thoroughly, but gently. Spray 18 muffin cups (I'm lucky, I have a 12 cups tin and a 6 cups tin, so it works out perfectly) with baking spray. Fill each one just to the top with salmon mixture. Tips and recipes for making salmon patties from the ThriftyFun community. Post your own below. My Mom made these when I was a kid. I love them. Mix all together and fry in a small amount of olive oil or canola oil until golden brown, turn over and brown the other side. Drain on paper towels. I like these with mashed potatoes, early peas and homemade biscuits. Mix all ingredients together until you can form salmon patties. You may need to add some extra cornmeal to make them hold together. Fry in hot canola oil to brown on each side. Drain on a paper towel until ready to serve. You can use either left over cooked salmon or canned salmon for this recipe. Mix salmon with leftover or instant mashed potatoes, you want the potatoes firm. You can add an egg if you like. Roll the patties into a ball then roll the ball in a flour/Old Bay seasoning mix. Have your oil hot, put the ball in the oil then carefully flatten with your hand. Flip once and serve. I can at least 12 cases of salmon a year, so my kids are used to every recipe on the planet for salmon, and THIS one is their favorite! Mix everything together and put in greased muffin tins (or use cupcake papers). Bake at 350 degrees F for 30 minutes. I usually serve this with peas and coleslaw. I use the same recipe for salmon patties that my mom used when I was small. One can of salmon, one egg and enough crushed crackers to hold a form. Then fry until golden brown. Yummy! This recipe makes about 8 good sized salmon patties. Put your salmon in a large bowl. Don't drain it. This makes the patties more moist. Be sure you get out all the bones. Cut up your onion in small pieces and add to salmon. Add eggs and smashed up crackers. Mix it up well. Shape into patties. Fry in a skillet until lightly browned on both sides (a few minutes). You can finish them in the skillet (fry them longer) but I bake them in the oven on a cookie sheet for about 30 minutes until they're nice and brown. That way I don't have to stand over them until they're cooked. I can pop them in the oven and make whatever else we're having for supper that night. I drain the salmon and break it up so that it is as mashed up as possible. I generally use about 4-5 green onions for a large can. I use the entire onion, chopping it finely. I add egg, finely chopped fresh parsley (I prefer the Italian type), and bread crumbs. There are no hard and fast rules about quantities. You can judge by the way the mixture feels. You want them dry enough so that they don't fall apart, but moist enough so that they have a nice texture, consistency and flavor. I mix it together thoroughly, and add lemon juice as needed to flavor and moisten it. I add enough bread crumbs to make the mixture stick together. Form into patties (a large can makes about 4 patties.) I like to refrigerate them for a couple of hours before cooking. Use Canola or Olive Oil and coat the bottom of a pan with the oil, and heat the oil. Add the salmon patties, and cook until lightly browned and fully cooked on each side. If you want the patties to be crispier on the outside, you can coat them with corn meal. These are wonderful left over or cold, as well. I learned this recipe from my mother, who actually made it up. It's a real favorite, too. I use something called Old Bay. It is a seasoning for seafood. Been around for years. Still comes in a yellow can and has recipes on the sides and back. I also add fresh herbs and bread crumbs. They have to be fried in an old black cast iron frying pan! As a young bride, I asked my mother how she made these patties and mine never were as good as hers. One day, I watched her fixing dinner and realize what she put in them. I have been doing it her way ever since. I usually have cornbread with my salmon so I make up a larger batch of cornbread batter and add some of this to the salmon, stirring until you get the correct consistency, add a tablespoon of dehydrated onion and then fry as usual. Bake or fry the cornbread batter that is left. Sounds funny but is really good. Rinse and drain a 14 3/4 oz. can of salmon. Add 1/2 cup bread crumbs ( I always use leftover bread made into crumbs in mini food processor ), 1/4 cup minced red, yellow, or green bell pepper, 1/4 cup minced onion, 1 egg, 1 Tbsp. lemon or lime juice, 1 tsp. minced garlic, a pinch of sea salt and several turns of ground fresh pepper. Mix all together and form into three or four patties depending the size you like. Add a little light olive oil to a non stick frying pan and brown patties turning several times for about 7 to 8 minutes, until nicely browned. I serve these on lightly toasted whole wheat buns with homemade tarter sauce. I make my own tarter sauce with lite miracle whip, a little minced onion to taste, drained sweet relish to taste. Then top with romaine lettuce or greens you have on hand and a slice of tomato. If you have any leftover, you can serve the patty cold the next day crumbled in a tossed salad with your choice of salad ingredients and dressing of your choice. This is a great recipe to get a serving of fish into your weekly menu. Source: This is a recipe my mother in law gave me when we were first married for a small salmon loaf. Instead I make it into salmon patties. These are also extremely good, easy and quick to fix! This recipe is a family favorite. It's great for evenings when I'm pressed for time and want to put a good meal on the table quickly. I just add a couple of vegetables as sides to the patties, and I have a meal in about 30 minutes. Until I made these, I had not had any good salmon cakes since being diagnosed with Celiac disease 9 years ago. This time, I used gluten free bagels for thickening and they turned out to be delicious. They are flavorful and crunchy, just like I like them. When I make these, I freeze the leftovers and heat them for another meal or just when I'm craving one. My mom used to make these regularly when I was growing up. Love these! Very simple and not expensive to make. I learned to love salmon at a very young age. We ate salmon a lot when I was a kid. These burgers are truly a great recipe! Drain salmon, reserving 1/4 cup juice. Discard salmon bones and skin. In a bowl, combine the salmon, egg, flour and dill; mix well. Stir baking powder into the reserved juice; add to the salmon mixture. Place salmon and liquid in a large bowl. Remove skin and center bone and discard. Add remaining salmon patty ingredients and thoroughly combine. Shape mixture into 12 patties. Recipe for Inside Out Bacon Cheddar Salmon Patty. Ahead of time fry your bacon pieces slow as frying slow makes the flavor much better. Slice up cheddar cheese of your choice from the bar cheese size. . . In a medium bowl, combine all the ingredients, mixing well and shape into burgers (mixture will be moist). Recipe says to grill them till brown. (I used a nonstick pan w/ very little oil.) Serve on hamburger buns. Makes 4 burgers. Are there any good salmon patty recipes? Mix and scoop up some in your hand and make a patty. Holding the patty on one hand sprinkle a good portion of corn meal on the top then turn and do the other side. Place in a skillet of hot oil and when one side is brown turn them over. These are wonderful. Combine the first 9 ingredients; mix well. Shape into 4 patties. In a skillet over med heat, cook patties in butter until browned, about 6 minutes. Serve on rolls with lettuce. This is a Taste of Home receipe I've been using for several years. Yummy! My recipe is not as elaborate as the two before me. To a can of salmon, I add crackers or bread crumbs, diced onion, egg and a little bit of milk to the consistency to hold it all together. I fry mine in bacon grease until they are nice and brown on both sides. Yummy~! 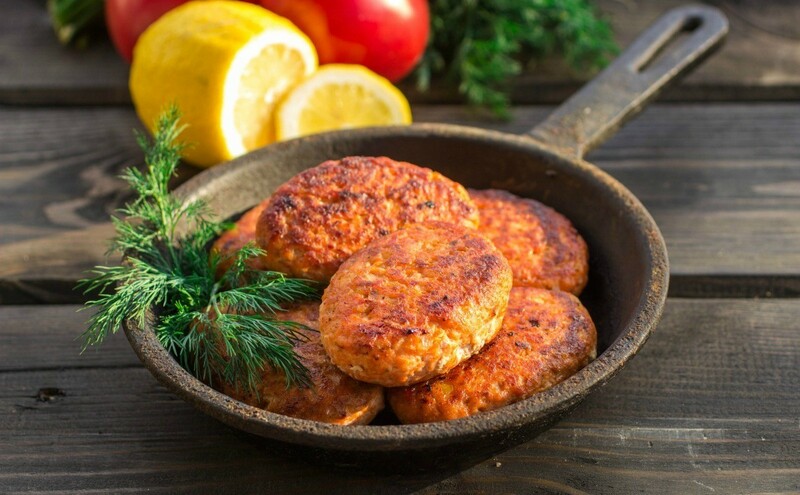 A great way to stretch salmon meat to feed more people is by making salmon patties. This page contains salmon patties tips and tricks. 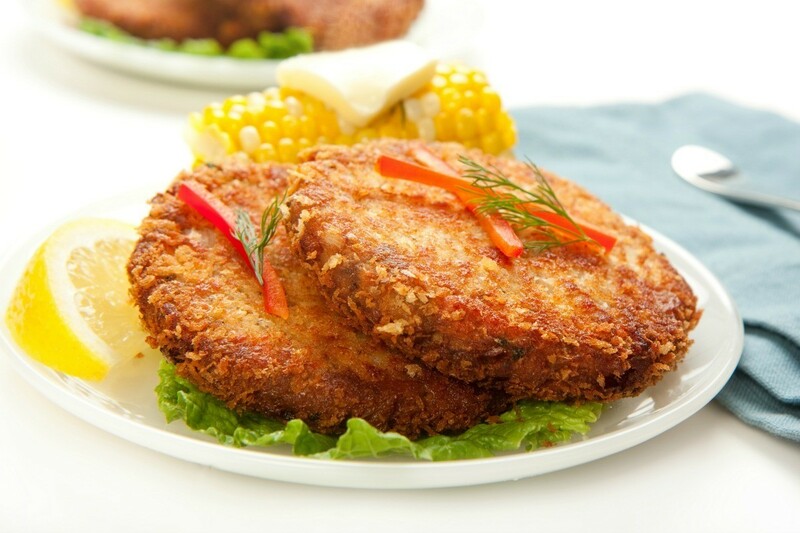 This guide contains a cornmeal salmon patties recipe. 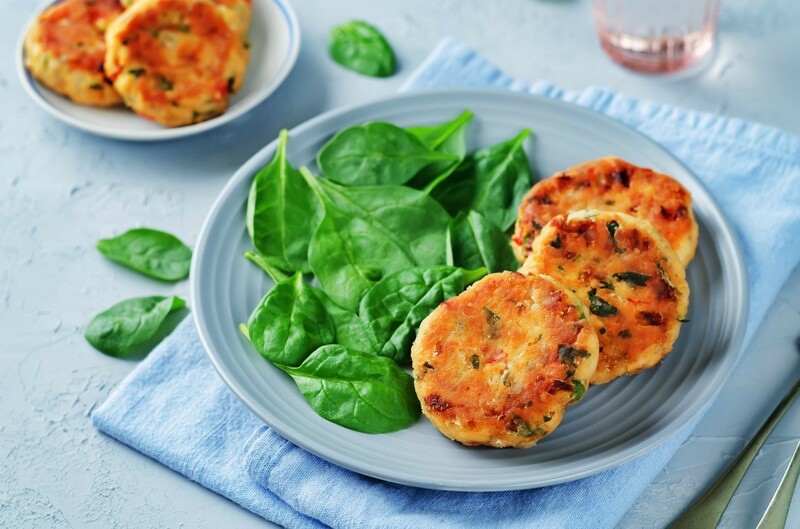 These delicious salmon patties are made with canned salmon and a few other ingredients. They are full of flavor and easy to make. 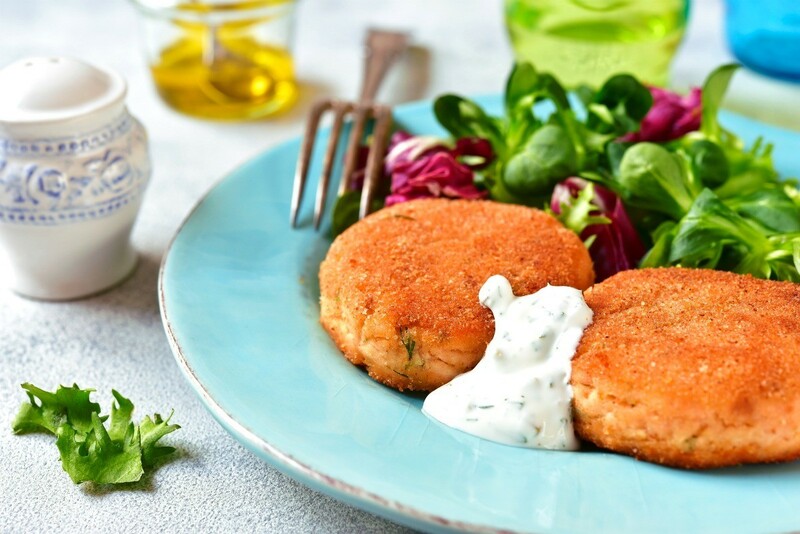 This is a guide about making salmon patties using cottage cheese. 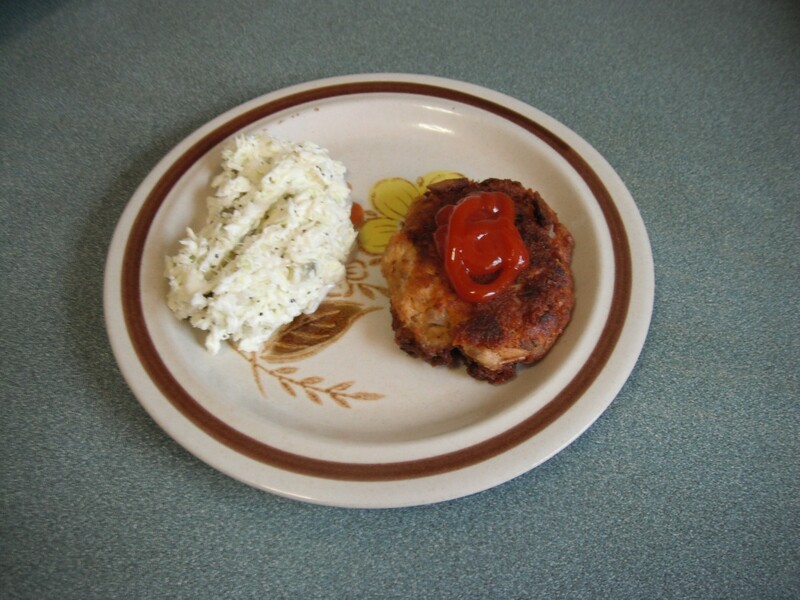 Try adding cottage cheese to canned or leftover salmon to make delicious patties.